There are a lot of reasons to add subtitles to a video. And there are many different ways to do it. If you can read and follow this simple instructions you will be able to add subtitle and add caption text to your videos with ease. You have just two options which are to quickly learn how to do it yourself or pay for a professional video editor to add subtitle and caption to your videos. When you create a caption or subtitle you will have to create a text file that gives you sound, transcription and even time stamps for the frames you wish to add them to. You can make subtitle or caption yourself or hire a professional video transcription & captioning company to provide a caption file. Such as 3play , Rev or Amara . There are numerous file formats to choose from including srt, scc and ttml. If you want to add caption or add subtitle to your video then you will first need to know that the compatible format for Vimeo is .vvt/WebVVT. You need to start by logging into your Vimeo account and uploading your chosen video. To add caption file you will need to select Advanced menu and choose the caption file you want to upload. It’s now time to select your caption file and choose which type and language you require. If you want to add subtitle in numerous languages you will have to continue to repeat the previous step for each. Once you have completed your caption and subtitle edits you will need to save your changes and return to your chosen video. On the retune you will see at the bottom right of the screen a 'CC' button. This will allow you to turn the captions off and on as well as change the languages the captions and subtitles are displayed in. Wondershare Filmora is the best software to use to add subtitle or add caption due to the numerous editing options that allow you to make it your own. They have everything from animated text effects and balloons to introductions and credits. The software allows you to add, remove and favourite your desired effects and you can add numerous tracks to make future edits easier. Customise the font to make it stand out as your own, including matching the text to any logo you may have and much much more. 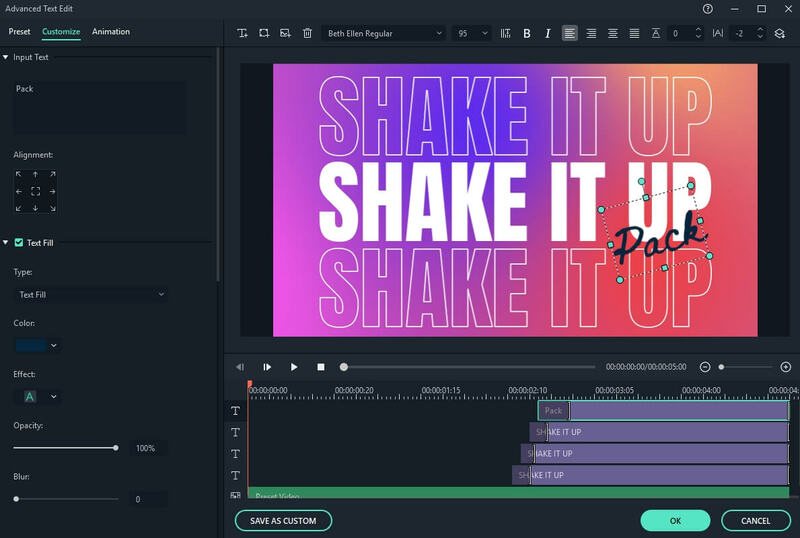 By using Wondershare Filmora you can add subtitle and add caption effects to reach out to more people than you thought possible and have more power than similar software. After dragging-n-dropping your Vimeo video to the timeline, click the “Text/Credit” tab on the Tool bar, then you will see there are many preset templates available. Click the designed template and then drag it to the Text track in the timeline. Double click the Text/Credit template in the Text track and edit it further in the Advanced Text Edit window. You can change the color, size, font, effects, duration and opacity depending on your requirements. You can also save the edited Text as a preset so you can use it directly in the next time.